The continuous struggle of the Bedouin community in southern Israel has once again caused a stir with a move Bedouins are calling "racist." "We will continue fighting. We will not leave our land," residents of Umm al-Hiran, an unrecognized Bedouin village in the Negev slated for demolition, said. The government intends to build a new Jewish settlement called Hiran in place of the village. "They say they want to evict us because of illegal construction," Salim Abu Al-Kian, 53, told Ynet. "We are ready to reach a settlement on the matter. We're willing to get permits for homes that have yet to receive them. Unfortunately, the state does not want to help us. They want to expel us from our land. We have no value to them," he said. After a stretched out legal battle, the National Council for Planning and Construction rejected the motion submitted by the Bimkom organization and Adala, the Legal Center for Arab Minority Rights in Israel, and approved the government's plans to establish a new Jewish village in northern Negev. The new village will be built in place of the Bedouin village which currently houses 500 people. Amna Abu Al-Kian said that she would be willing to die before leaving her home. "I have six children and we have nowhere else to go to." "Instead of the state helping us, we are thrown out to the street like animals," she exclaimed. Other residents of the Bedouin village could not understand the council's decision and offered an alternative solution. "We wouldn't mind living alongside Jews. I wouldn't object to us being neighbors," said Salim Abu Al-Kian. "You can’t just take an Arab and put a Jew in his place. This is racism. This is the Nakba of 2012," he added. Another Bedouin resident said "we're citizens of the state of Israel. Israel claims to be a democratic country but it has neglected its citizens for decades. Why not recognize our rights? We have been the most loyal to Israel since its establishment. They can't keep pushing us into a corner." Attorney Suhad Bshara from the Adala Center said that the "government's decision coincides with Israel's policy to expel the Bedouin residents from their lands and destroy their homes in order to clear the land for Jewish settlements." 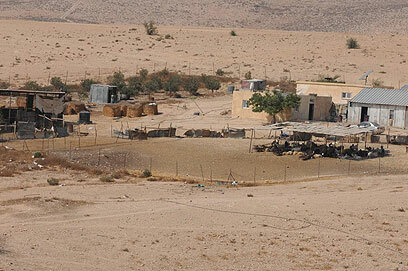 The authority charged with regulating Bedouin towns in the Negev said that many of the residents have already found a solution – they are to move to the nearby newly-constructed Bedouin village of Horah. See all talkbacks "'Turning Bedouin village into Jewish settlement is racist'"